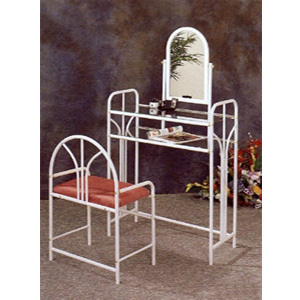 White Art Deco Vanity Set With Two Glass Shelves & Stool. Mauve Velour Cover On Stool. Strong Construction. Easy To Assemble. Details: Vanity: Width: 29 In.x D: 13-1/4 In. x Height: 51. Stool: Width: 19-1/2 In. x D: 13-1/2 In. x Height: 22-1/2 In.